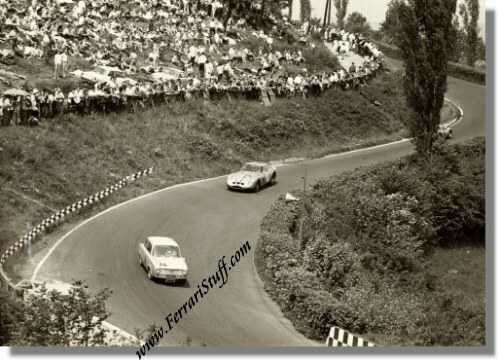 Vintage 1964 photo of Ferrari 250 GTO S/N 4153GT at the Nurburgring 1000 KM. This is a vintage 1964 photo of the Ferrari 250GTO of Marquis Philippe de Montaigu which was driven by Gustave Gosselin & Francis van Lysbeth to 18th place overall and 4th in class during the Nurburgring 1000 KM race. The car in the foreground is the Glas 1300 GT # 14 of Pierre de Siebenthal & Hermann Windler which would crash out of the race in 70th position. The Ferrari has an extensive racing history and now seems to reside in Germany. The photo measures some 30 x 21 cm or 12 x 8 inches and is in mint condition.